» Archived Review: A. FIELDING – The Cautley Conundrum. Archived Review: A. FIELDING – The Cautley Conundrum. A. FIELDING – The Cautley Conundrum. Collins Crime Club, UK, hardcover, January 1934. 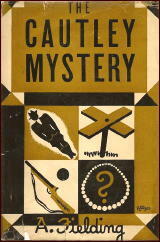 Published in the US as The Cautley Mystery: Kinsey, hardcover, 1934. A later appearance of Chief Inspector Pointer, and in comparison to the breakneck pace of the previous book [The Net Around Joan Ingilby], just reviewed, this one, some readers may feel, is downright soporific. Well, not I, even though most of the 250 plus pages take place within walking distance of Bunch Cottage, where Jack Cautley, one of the four Cautley cousins makes his home, even though it is Major Howard Cautley to whom it actually belongs. And among the four, it is the Major who has the money, and it is he who on page 40 is found dead, lying across a stile after having gone shooting, his gun lying beside his body. It is at first assumed to have been a dreadful accident, but at the same time, a valuable necklace, a family heirloom, is discovered to have gone missing. The local police in the guise of Superintendent Wanklyn, at the Woodhaven police station, do not believe strongly in coincidence (nor does the faithful reader) and eventually Pointer is called in from Scotland Yard. Accordingly, in mind-expanding fashion, there follows a story full of questions, evasive answers, long-shot inquiries, other deaths, puzzling tales, and a plethora of clever observations. The characters are extremely well-defined as well – there is no mistaking one for another, even though there many, many of them, and all of them have their own desires and motivations. It’s not a book for most modern readers, though. It’s too stationary. It moves, and yet on the surface, it doesn’t. There’s no flair there, you might say. Or you might not. I enjoyed it, but largely as an intellectual endeavor only. I truthfully have to admit that I enjoyed the earlier adventure more, as rough and unruly as it was. If I’d read this one first, I confess, I probably wouldn’t have read this second one. Your review could be the definition of the Humdrum school. A ‘largely intellectual endeavor only’. It does sound as though there was a flair for characterization from here and the previous review though which often wasn’t true of Humdrums.